Sailing boats all use a Kicker for adjusting boom height and the shape of the mainsail. Bamar kickers consist of two anodised aluminium tubes with special end connectors and built-in pulleys; this makes a neat, seamanlike tackle which, if required, can be controlled directly from the cockpit for ease and safety. The internal spring - which is adjustable for tension - gives ample lift to the boom for safer reefing and furling. The material used are of the highest quality: the tubes and end connectors are built in aluminium which as been manufactured using computer controlled technology. Pulleys are of a special plastic produced for use in salt environments. Pins are made of 316 stainless steel. The spring is of hardened AISI 330 stainless steel. Bamar kickers ensure that every boat has that extra something which gives: better mainsail control and performance, easier reefing, greater safety. 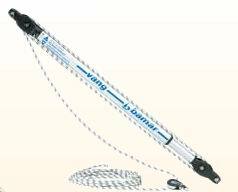 Features: Boat length: 35'-44'; “U” length with boom at 90°: 1050-1850 mm; Length: 2000 mm; Max. cutting: 600 mm; Total travel:250 mm; Thrust (with mounting preloading): 180 Kg; Rope diam. : 9 mm; Reduction ratio: 4:1; Weight: 7 Kg.